CD reviews: "The Troubadour's Table," "Good Day Sunshine" and ""
These reviews first appeared in the October 19, 2006 issue of the North County Times. Fred Benedetti, Peter Pupping and William Wilson are all releasing albums from the Encinitas-based GuitarSounds label at the same time. The music heard on the discs ranges from tango to classical to pop/folk/rock. Tying all three releases together is a level of virtuosity on acoustic guitar that probably only real guitar nuts can fully appreciate. Your loyal correspondent took six years of classical guitar lessons in his early teens, has listened to thousands of guitarists since then, and is still trying to wrap his head around some of the playing here. Wilson's "Tango for One" is a set of 17 tangos, divided between compositions by the great master Astor Piazzolla and famed composer Alberto Ginastera. They are intentionally arranged for listening, not dancing to. While the slowed-down tempo he chooses works well at bringing out some of the deeper hues of the music, the combination of the spare sounds of a solo guitar and the slow tempo combine at times to make the album almost somber. The joyous sensuality most often associated with Piazzolla's music (or tango in general) is largely absent, and at times Wilson's approach and playing style gives the songs more of a Spanish tinge than South American. Still, you can't argue with the pure beauty of his playing, or his taste in song selection. 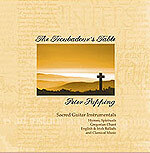 Pupping's "The Troubadour's Table" is a collection of sacred music arranged for solo guitar. The material ranges from Bach to Satie, from Shaker hymns to traditional Irish hymns to American spirituals. Pupping performs each with an elegant, subdued approach that brings each note to the forefront. The recording quality is incredibly clean, the sound warm and full. It is as lovely a classical guitar album as you'll ever find. 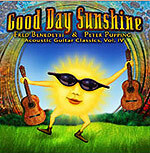 "Good Day Sunshine" by Benedetti and Pupping is the odd one in this group. A collection of acoustic guitar covers of popular rock and pop hits, it is apparently the fourth in a series of "Acoustic Guitar Classics." But it has to be asked: Does the world really need another cover of "Stairway to Heaven" or "Sgt. Pepper's Lonely Hearts Club Band"? Or "Brown Eyed Girl" or "Peaceful Easy Feeling," for that matter? They're all competently performed, and Benedetti and Pupping seem to be having fun. Lord knows they can both flat-out play, but even their considerable chops aren't enough to find anything new or interesting in these tired-out war horses they're playing.